Yesterday saw the last of my xmas craft fairs. Despite the torrential rain and gale force winds affecting the UK at the moment, lots of people made the effort to attend and I sold TONS. 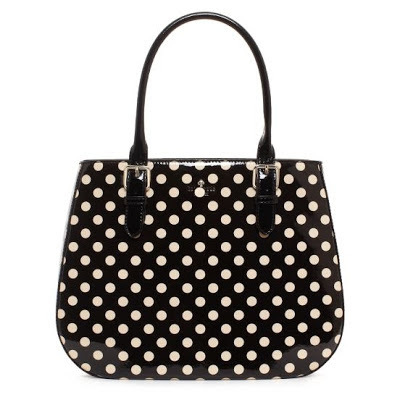 Well, not quite, but I did make a sizeable dent in my tooth fairy cushion mountain and more than enough to alleviate the guilt of buying this Kate Spade bag…. I know it's hideously expensive but I don't buy clothes anymore, and this bag couldn't be more perfectly me if it had JANE scrawled across it. Anyway, mad bag purchases aside, the pressure is definitely off and I'm looking forward to getting back to dressmaking. Having worn my Peonyesque knit dress an embarrassing number of times, I really have to make something similar. I received some great suggestions after asking for advice on knit patterns, but it was reader midsummermellie who directed me to Maria Denmark's fab range, thanks Mellie! They were exactly what I was after and I ordered two patterns straight away. I've heard good things about Maria Denmark patterns from Sew Busy Lizzy who has an interview with the designer here, and from the queen of knits herself, Scruffy Badger, so I'm optimistic to say the least! The patterns arrived this week and I'm pretty excited to start work on them. 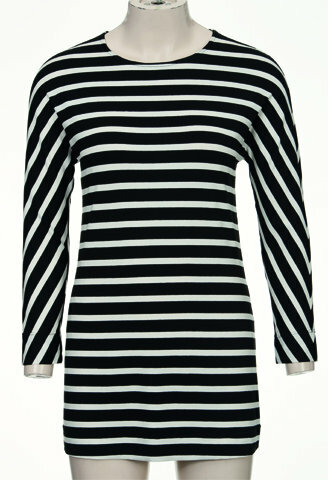 Last February I had serious top envy after seeing Kathryn's gorgeous striped kimono sleeved top. As per usual, I wanted one exactly the same, but the pattern was from Burda which inevitably meant it went to the bottom of my sewing queue. I don't know about you, but a morning spent printing out twelfty sheets of paper and sellotaping them together, then adding a seam allowance is not my idea of fun. The printed sheets had been languishing in a cupboard for months on end, until my new found sewing-with-knits obsession had me hunting feverishly for them. I gritted my teeth, put the pattern together and a few hours later, I had my very own kimono sleeved striped top. Hoorah! Because the sleeves are incorporated into the front and back pieces, the top is ridiculously fast to make. Sadly, I only had one metre of striped jersey, so had to cut the back with a seam up the middle and the sleeves a little shorter. After cutting out, it probably took about half an hour to sew together the main body of the top and that included patiently matching stripes as I pinned the front and back together. I predict that with a plain or non-striped knit, this would take about half that time to sew. Finishing the neck probably took another hour… I originally added a neckline piece of self fabric, but seeing it in the mirror made me realise I didn't actually like the height of the neckline at all. I removed it, lowered the neckline slightly and added a strip of red bias binding. My fabric is a cheap Goldhawk Road buy and is pretty stretchy and drapey, so the neckline is a bit looser than I'd like. Not loose enough for me to change it again though, I'm quite happy to wear it the way it is. I made a Burda size 38 and it's a nice tight fit, which is what I was after. The length is very long though - when I originally tried it on it looked exactly like dresses I used to wear circa 1986 i.e. arse skimming. I'd have modelled it for you, but sadly didn't have a pair of waxed Doc Marten shoes handy to complete the look. I'm particularly pleased with the chevron effect on the arms, which is a mixture of a bit of half hearted stripe matching and a lucky fluke. 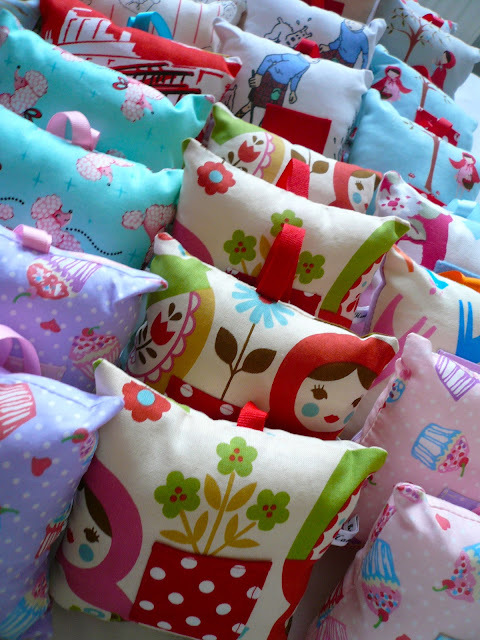 After a hectic few weeks making stock for my Xmas craft fairs, I think I'm almost there. I've made purses, mobile holders, lavenders bags, cushions, zipped pouches, 1950's half aprons, kid's wash bags and reversible shopping bags. 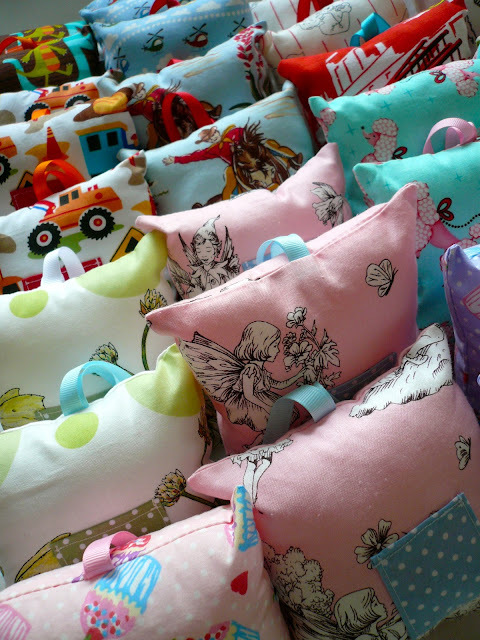 But the item I'm most pleased with is my small army of tooth fairy cushions…. I thought they reminded me of something…..
As cute as they undoubtedly are, they were definitely taking over my sewing room, so I'll be quite pleased to see them go. Some were a repeat order for Rosy Rosie and the rest are for me to sell at my Xmas craft fairs. After my fairs are over I'll hopefully have a bit more time to get back to dressmaking, yippee! My first fair is tomorrow, wish me luck! I'm pretty excited to share my latest sewing experiment with you as it's something I've put a lot of time and effort into. My standard approach with dressmaking is to start with a pattern (usually after seeing somebody else's version) and copy it faithfully, perhaps shortening a sleeve or adding a lining, nothing too risky. What I'm NOT good at is drafting anything of my own design or dramatically altering a pattern (apart from the length, which is a standard adjustment for shorties). I just don't have the patience, the mathematical application or the precision required. That's all absolutely fine and I've never lost sleep over this - there are more than enough perfect patterns in the world to keep me happy forever. With this latest project however, I just couldn't find a pattern that seemed to tick all my boxes. All I wanted to make was a fitted knit dress with long sleeves and an A-line skirt. Nothing too unreasonable you'd think, but I changed my mind on this project so many times I lost count. Throughout the whole process, one pattern kept lurking at the back of my head - the Colette patterns Peony. I've made it twice now - here and here - and having made a few adjustments to the back bodice the first time I made it, I was happy with the fit. I wasn't totally sold on the boat neck though, even after lowering it and shortening the width of it on my second version. My solution? I simply traced the neckline of the Alma blouse (which I love) and merged the two patterns together. So far so good. I now needed to see how it looked sewn up. I thought it was all going to be so easy… my plan was to simply go down one size to allow for the extra stretch and hey presto, I'd have a Peony in knit fabric. Yeah, right. Going down a size was never going to be enough. So I spent an entire day sitting at my machine, deshabille, trying the bodice on, pinning it, taking it off, resewing the darts, taking it off, slicing a bit off the side seams, taking it off, fiddling with the shoulder seams, taking it off…. you get the picture. Knit fabric is very forgiving and very compliant, so before long, through sheer dogged persistence, my bodice was the exact fit I was after. By this point however, any pretence of measuring and pattern adjustment had flown out of the window. I was totally making it up as I went along and I have no idea what size and shape the bodice ended up as. I sewed the whole dress on my overlocker, with the exception of the darts (which were sewn with a straight stitch and a jersey ballpoint needle) and the hems, which were sewn with a twin needle - my new favourite sewing toy. I love the speed with which a dress can be made on an overlocker, especially as there were no zips or facings. I deliberately went for a plain grey as I wanted it to be a blank canvas dress that would go with any combo of shoes/tights/cardigans (see above). For fabric, I used a grey marl Roma jersey from The Fabric Godmother. I asked for a sample first, just to see how stretchy it was and was impressed by what great quality the fabric was - nice and thick but still retaining a good amount of flattering stretch. So, what did I learn from all this? If ever there was a case of 'do as I say, not as I do" then this is it. 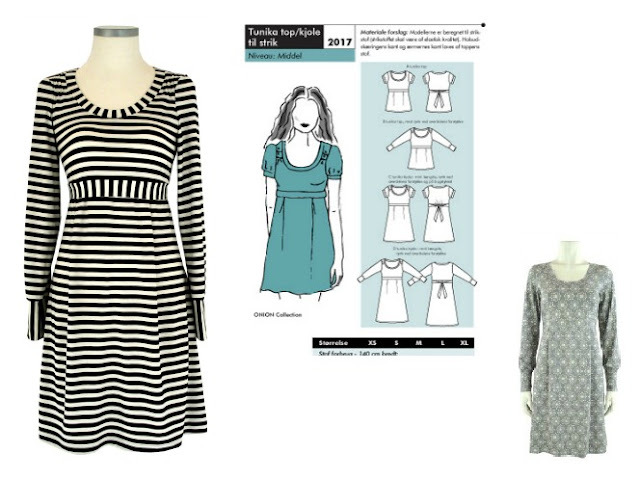 And what I say, is, if you're inexperienced sewing with knits (as I am), it's NOT a good idea to try to convert patterns specifically designed for woven fabrics and hope for the best. Next time I will definitely be using a pattern that's specifically designed for knit fabrics, I'm sure it would take about a quarter of the time. 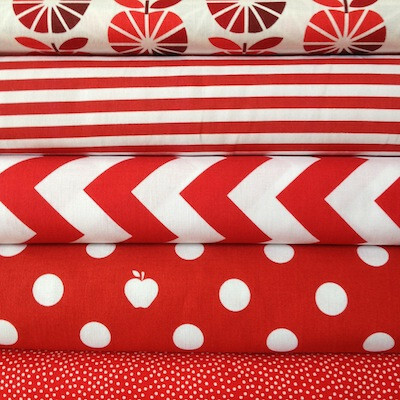 Perhaps something from the Sew U Home Stretch book, or Kwik Sew 3659 which Winnie used for her lovely polka dot knit dress. Actually if anybody has any pattern recommendations for knit fabrics please let me know. You know my tastes by now, nothing too flouncy and preferably quite fitted. Hello hello! We've just had school half term here in the UK and despite the torturous experience of holiday homework (like pulling teeth) we had a really fun week, peaking mid-week with Halloween and the thrill of a bucket full of sweets each. I also took the opportunity to swap my summer wardrobe for an autumn one and sort out my sewing books. Ahem. Yes, I have a slight problem in this department. 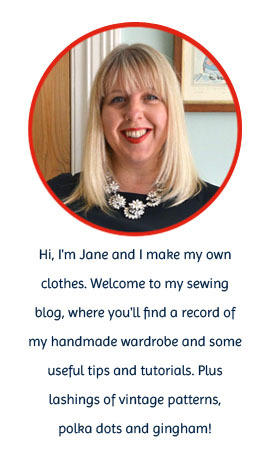 As with sewing patterns, I have a compulsion to hit the 'add to basket' button for any sewing book featured on a blog before I've even finished reading the blog post. I know I'm not the only one with this little habit, which makes me feel better, but it still leaves me with the problem of shelves and shelves of sewing books that never get used. So I've been ruthless and decided to sell all the books that aren't in everyday use. I've read them all and can highly recommend each and every one of them, but it's time for them to find a new home. 1. I'll post the books out at cost - estimated first class postage is listed next to the price. I'm happy to ship anywhere, but books are heavy so it may not be cost effective for overseas readers. 2. Payment via a Paypal account please. Meet Me at Mike's by Pip Lincolne NOW SOLD! A few of the spirals have come undone from the binding (see picture). The binding was like this when I bought it and I couldn't be bothered to exchange it. 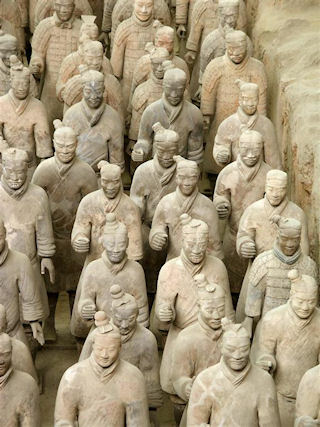 Otherwise, mint condition, all patterns intact and unused. 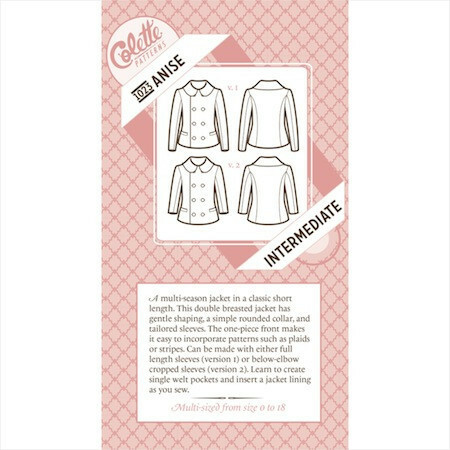 Design-it-Yourself Clothes by Cal Patch NOW SOLD! Chic on a Shoestring by Mary Jane Baxter NOW SOLD! The Bag Making Bible by Lisa Lam NOW SOLD! Mint condition, all patterns intact and unused. If you're interested in purchasing any of the books, please leave a comment after this post. And now, without further ado, I'm delighted to announce the winners of my bloggerversary giveaway. 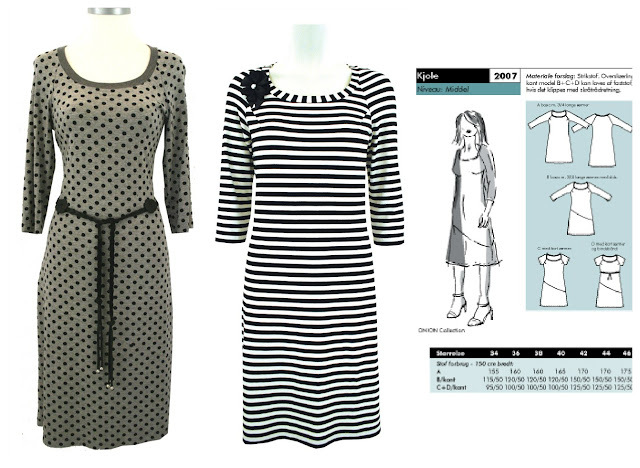 The winner of the Colette Patterns Anise pattern is Karin from Sew Here We Go Again! Hoorah, hoorah, as it's the 5th November here in the UK, I'll let off a few fireworks in celebration! Congratulations ladies and happy sewing. Please e-mail me your addresses and I'll get your prizes to you ASAP. Once again, I'd like to say an enormous thank you to Kate from M is for Make for so generously donating both giveaway prizes.